MoMo tires has recently launched 17 inch tyres having the same profile with unconditional warranty for 2 years. Going by the reviews of some owners this option seems to be the best bet. Period. The tyre launched by Momo is 215/50r17. Although it's the same profile, it has wider section. It is a good size to upgrade to though. As Momo is new in India, I would still wait for reviews before saying they are the best bet. The current best tyre choice for me would be Michelin Pilot Sport 4 215/50r17. Completed my first highway drive from Bangalore to Chennai & back. How is the 6th gear? At first, I thought this gear is best engaged above 100kmph. During the drive, I found its flexible enough to be engaged as low as 60 kmph. So lets say I'm driving at 120kmph, and I encounter the typical scene of 2 slow moving lorries trying to overtake each other on a 2 lane road. As long as one of them was above 60 kmph, I could hold on to the 6th gear. It takes a bit longer to pick up speed, but once it crosses the sweet spot of 1700 rpm, the turbocharger kicks in & acceleration is faster. As you can see, the other advantage with the 6th gear is that the engine is running at a relatively lower RPM, so the cabin sound is lower. In situations where I had to drop down my speed below 60 kmph, I switched directly to 3rd gear, finished the overtake and went back to 6th. Overall, a fun to drive vehicle on the highways. The car felt stable at high speeds. When I compare to my earlier hatchback car, the biggest difference is the confidence this car gave whenever I did triple digit speeds. It felt solid, no vibrations. I suppose the wide 17" tyres also helps. Although the recommended tyre pressure was 35 / 41 (front / rear), I filled it with 34 / 38. The steering weighed up well above 60 kmph esp when I compare to the lightness it gives when I drive it at slower speeds in the city. I found the brakes a tad more sensitive at higher triple digit speeds, not sure exactly which technology was at play (ABS or EBD). I felt it was a good thing from a safety standpoint. Honestly, I wasn't going for mileage at all in this trip. Since I'm due for the first service, I wanted to vary my speed throughout the trip, which is quite easy to achieve considering the insane lorry traffic on our highways. I never engaged the cruise control feature and the A/C was on all the time with auto climate control. On my onward journey, the MID showed an average mileage of 16.6 kmpl. My return journey was at 15.8 kmpl. I could probably get a little more if I used cruise control at 80 kmph. On the highways, the sunroof brings in more light in the cabin, which is otherwise dark thanks to the all black interiors. And my 6 year daughter is crazy about the sunroof, she is always the first to open it up. Also brings in fresh air, but you need to get used to the wind noise esp when you are doing triple digit speeds. I tried opening other windows, but that didn't help much with cutting down the wind noise. As mentioned in the official review, the instrument cluster is so much better on the S variant. 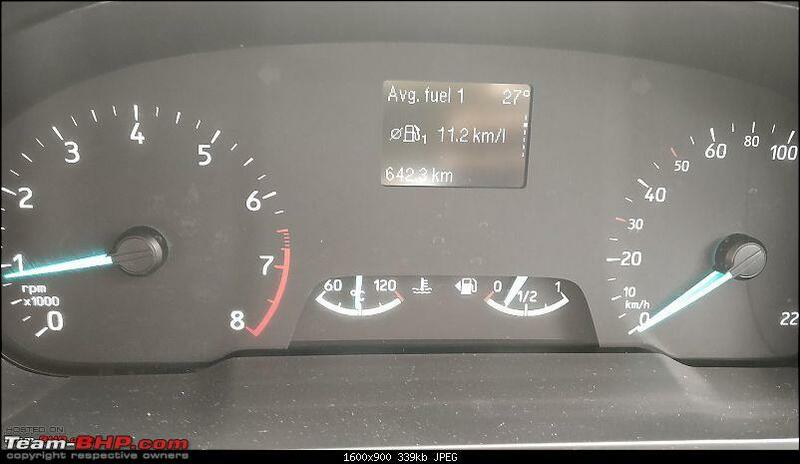 When compared to other cars in the same segment, it feels like a must have, its a shame that Ford is using such a plain instrument cluster on the lower variants. Both the trip meter & My View displays can be customised to your liking. I typically use the digital speedometer with instant fuel economy. This was something I felt that was different from my earlier hatchback car. The temp gauge was always right in the center, a little left to the middle throughout the trip, regardless of the speed. In my old car, the temp gauge used to drop down when I was cruising at high speeds. Not sure if this is something specific to the EcoBoost engine. Perhaps the experts on this forum can comment. All new cars get the mandatory Fastag sticker. This was my first experience using it on the highways. It was a hit & miss. On some tolls, the Fastag was a boon and I could move along quickly. Most of the time though, the dedicated lane for Fastag is actually more crowded than the other lanes, with lorries. And if the scanner has trouble, the waiting time is a lot longer. I think it would help if they made all lanes Fastag enabled. Have to live with it though. Overall its a brilliant car with an awesome engine. It would have been better had Ford offered S's MID in lower variants as an optional factory fit accessory. The temp gauge was always right in the center, a little left to the middle throughout the trip, regardless of the speed. I observed the same in my car too. The needle remained in this position even when I drove with a heavy foot. I was thinking the engine's temperature would be much higher after I pushed it above 4k rpm. Last edited by strawhat : 24th September 2018 at 10:00. 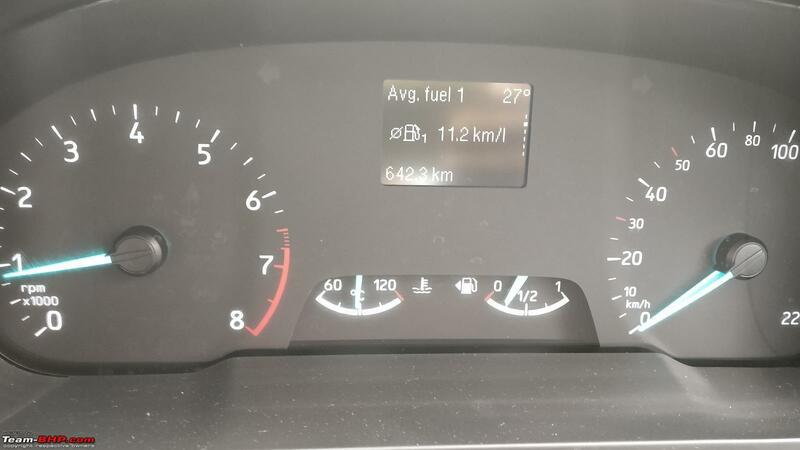 First of all thanks for sharing a brief review of the EcoSport S. Interesting observation regarding the temperature gauge. If I may ask, what was your last car? Almost in every car I have driven, from the humble M800 to the Ecosport 1.5 Dragon, the temperature gauge stays in one place (after the engine has warmed up). The temperature gauge is fixed at one place, even if you are stuck in traffic or cruising down a highway. Only in our antique 99 Maruti Omni, the temperature needle moves around a bit, depending upon the speed. So, what you are observing is perfectly normal, nothing to be worried about. Last edited by chiranjitp : 24th September 2018 at 19:11. Interesting perspective of the Ecosport from the US media. As expected lots of faults pointed out and a sub par option for them in the west. Noticed an intresting thing today when going through the Lamborghini Urus thread. 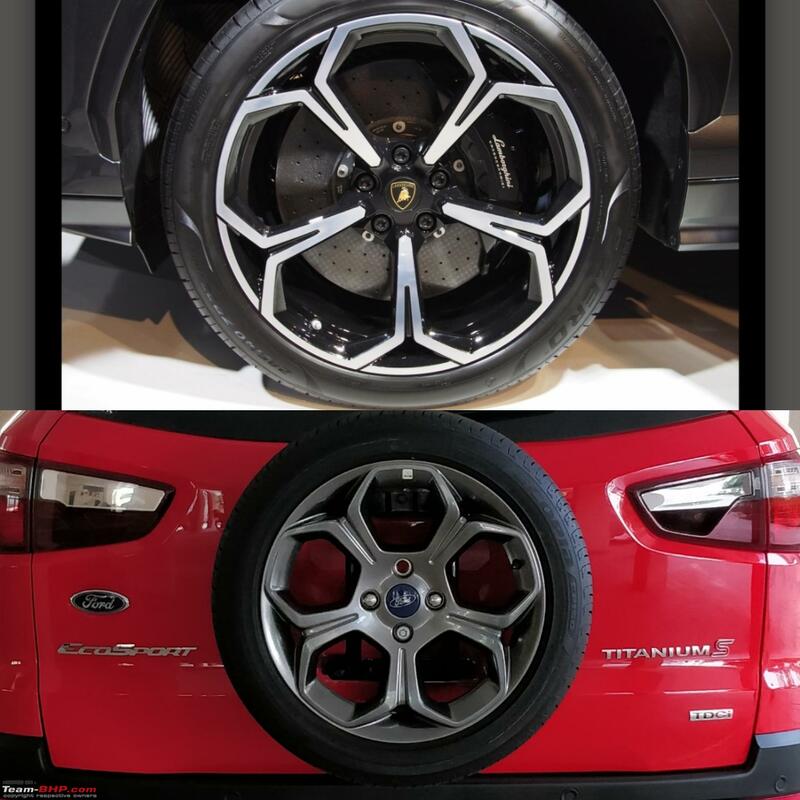 The Ecosport S and the Urus share a very similar alloy design! Pretty much the same opinion as the European reviews. The obvious fault that i see with it in other markets is the price. Example: In US, the starting price is same as a Jeep compass and more than a renegade. And the compass gets a full fat 2.4 litre engine there. Ecosport is clearly a class smaller and really not the cup of tea of Americans with its tiny 1L engine in the base model. Had the car been priced like the fiesta, under 15K for a decent spec, it would have sold great. A much better option than the Nissan sunny or Kia Rio there. At this price, even i would consider buying something like a civic instead. There is a Facebook group as well for all owners with Ecoboost nightmares, it seems to be from Britain with what I suppose is 1300+ failure stories. Ecoboost engine comes from Romania. The current ones come from romania but the first few batches were from their plant in Germany. Do we have information about any such cases of Ecosport ecoboost engine fire reported in India? I've seen a few ecosport fire videos on youtube but not sure if they were ecoboost ones. Am planning to go for this car, but such reports scare me. Last edited by asethi : 2nd October 2018 at 23:09. How does the ac work on the new EcoSport S? Does the cabin cool fast and how is the effectiveness of the ac for the rear seat passengers? Missing rear ac vents will be deal breaker for many, I guess! Saw the below video on YouTube. It's from BBC London and related to Ecoboost engine failures in Ford Ecosport in England. Both 1.6L and 1L engines were mentioned. Last edited by vvrchandra : 10th October 2018 at 09:06. Will upgrading the tyre to another with same profile have any benefit? 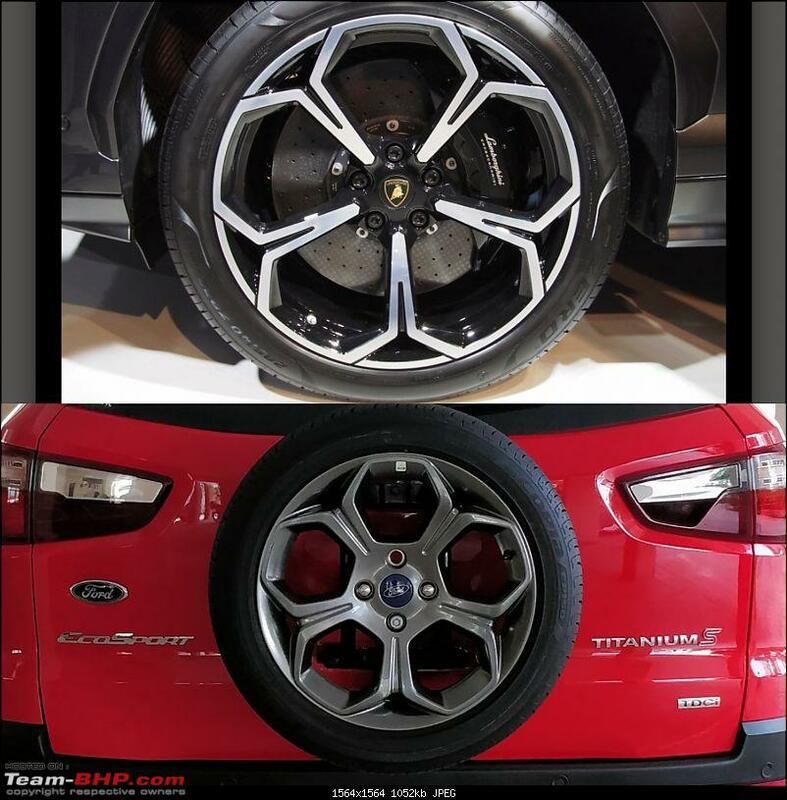 I am no expert, but going by the discussion in the forum, these are attributed to the low profile tyre. Or is it that both problems are because of Bridgestone Ecopia? Last edited by mxx : 15th October 2018 at 22:41. All times are GMT +5.5. The time now is 14:14.